Give our fresh, delicious milk a try. It’s good for you! Farming on our homestead can be traced back seven generations to Peter Bowman. Peter’s wife Tracy purchased 130 acres for their son Ruffin Bowman who continued his family’s farming practices operating a cotton gin, cotton press, feed mill, and saw mill. Ruffin’s son Albert pursued a political career as a NC legislator but couldn’t resist his love of farming. Albert grew tobacco and sold “barnyard” milk part-time. Roy Bowman, Albert’s son, began milking around 13 cows by hand. In 1947 Roy began a “Grade A” dairy so his sons Russell and Dwight could begin farming when they returned from home from serving in World War II. In 1960, Roy along with his two sons built their first milking barn with a double 4 Delaval, with automatic milkers. This parlor allowed the Bowman’s to milk 8 cows at one time increasing order and efficiency. In 1987 Roy’s sons along with his two grandsons, Chris and David, expanded by building a 16 head parlor which allowed them to grow their herd from 75 to 140 cows. In the late 1990’s dairies all over the nation were suffering from high commodity prices and low milk prices and the Bowmans were no exception. In 2000, brothers Chris and David along with their wives Jayne and Terry poured the new foundation to Homeland Creamery. The Creamery processed their first batch of milk which amounted to 30 gallons. They sold every jug right away to neighbors and local stores in their community. Today with the help of their 25 dairy and creamery employees the creamery processes over 7,000 gallons per week. Each week 3 route drivers deliver to various retailers, coffee shops, and bakeries from Winston Salem to Raleigh. In addition to the 3 routes Homeland Creamery manages, various distributors deliver products as for East as Wilmington NC and as far West as Asheville, NC. Our Natural Approach to Farming helps our animals and environment! Our family prides itself in our sustainable farming practices. Recycling cow manure not only helps keep our cows happy by providing clean facilities but it also acts as a natural fertilizer for our fields and pastures. We also practice No Till soil conservation which means that we don’t till or plow the soil to eliminate weeds when we prepare our fields for sowing. This process helps to reduce soil erosion and water runoff, improves wildlife habitat, and helps reduce greenhouse gases and fuel use. Furthermore, spreading the manure on the fields attracts earthworms and other insects that burrow in the soil aerating and weeding as they go. At Bowman Dairy, our priority is keeping our cows comfortable and happy. Scientific research proves that happy cows with low stress produce considerably more than those with high stress. 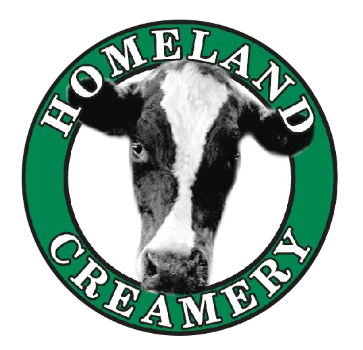 Homeland Creamery, LLC is located in southeast Guilford County in the delightful town of Julian, NC. We supply from Asheville to Raleigh with dairy products of the highest quality, freshness, and taste. Meet the Bowman family and learn more about the history of Homeland Creamery. Want to know where your milk comes from? Come visit our creamery store or schedule a farm tour to see how it all works.